As an introduction to Christian mysticism, its healing potential and the birth of its more contemporary movement then this book is an interesting read. It confirmed for me, or opens one´s eyes, the potential of who Jesus really was - a mystic and spiritual healer. 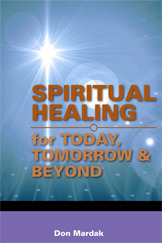 If you are looking for practical guidelines on how to utilize mystic healing by accessing the transcendental realm and infinite God consciousness then this book does not provide that knowledge or know-how. Nonetheless it points the reader in the real direction of ancient religious practices for accessing altered states of consciousness and the healing potential of these phenomena.